I decided to take the plunge and purchase some products last month and I am one happy camper that I did! The products are absolutely outstanding!! I could smell some wonderful scents from my box when it arrived. The packaging that my products were in totally blew me away. The brown box was sealed with a ribbon sealed with a pink CP rubber sticker went way beyond what I had expected and made me feel special. (It really was that lovely.) The items were individually wrapped in pink tissue paper and placed in pink filler. It was not easy to decide on what to try but I did limit myself… to mostly trial sizes. it is that good. My stylist asked what I had been using because my color had not faded and my highlights were still brilliant. This was even with me swimming in chlorine just about daily! I would mix up my use of the shampoos depending on the situation. I use very little shampoo product with some water and wow! instant bubbles. My hair has never felt so soft and healthy. The boys have enjoyed their sample of Macho Poo. clear, and radiant. I have had a problem of lotions breaking my skin out and this did not do that. *claps hands and jumps up and down* I have finally discovered a lotion that I can use. Plus, I only have to use a tiny drop! Can you say big bottle on the next order! The meow cleanser is quite gentle and makes a wonderful skin cleanser. I was so impressed with my order that I placed another. 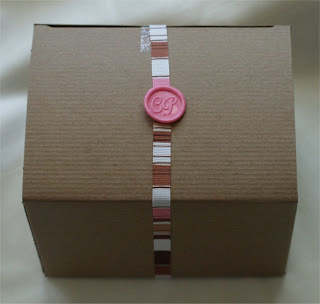 My order did not arrive in that lovely brown box *rats* but each product was wrapped in pink tissue paper. This time it was a reorder of the meow, a trial of the Never Ask A Lady, large bottle of Fishy Poo and another Princess Poo. I have tried the Never Ask A Lady and again, I am impressed. Sinks right into my skin, no breakouts and my skin just feels so nice. Another big hit with me!! Shipping does take a tiny bit of time with this company but do not let that deter you from ordering. The products well make up for that wait. This is coming from someone who has an issue with waiting for orders to arrive. I will be placing a third order and it will include a large size bottle of I’m 29. I am out and must have more, trust me this product is really worth it! I have not tried her soaps so perhaps that will find a way into my cart and I would really like to try her Monoi de Tahiti Body Lotion. Monoi oil is absolutely wonderful and your skin will enjoy the treat. CocoaPink is now one of my favorite sites and I think you will really like them too! I did break out my trial mystery sugar scrub and I am not disappointed. It is a foaming emulsified scrub that left my skin so smooth and soft. The fragrance was a great lime that was quite refreshing. Funny! I just took photos of Cocoa Pink to review this week too. I really was impressed with their packaging and the overall presentation of the package. Anne-Marie, I look forward to reading your review. I do agree that her whole presentation is quite impressive.